Good morning. 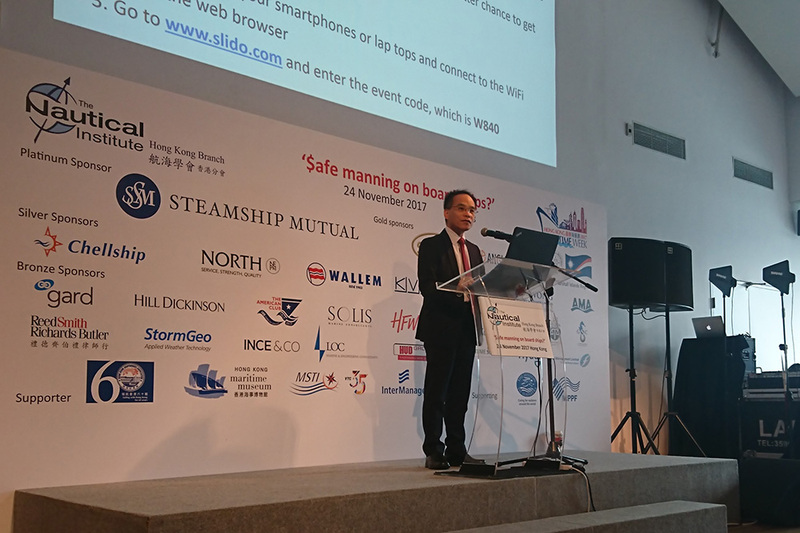 It is my great pleasure to join you at the Conference today and meet with such a respectful audience of maritime industry in Hong Kong. I would also like to extend my heartfelt thanks to the Nautical Institute for providing us such an excellent opportunity for the maritime friends here to share our insights. For captains and global business partners travelling afar to attend the conference, welcome to Hong Kong. The Hong Kong Maritime Museum is a great place for holding shipping-related conference. By looking out the windows, you will see many ferries and ships sailing in our beautiful harbour everyday. Unlike driving on the road, there is no traffic sign or road marking on the sea surface to guide the navigation of vessels. So many may wonder how the captains could manage to navigate their ships safely amid the busy sea transport. Safe manning of the ships indeed rely very much on the experiences of the captains and the crew members with the support of the shipboard technology. Shipping is indeed a very specialised industry. Sailing on the sea is full of challenges and risks. Even though we have one of the safest harbours in the world, accidents can and do occur. They are never wanted. It is therefore important to have qualified and competent seafarers with proper training on board the vessels to ensure safe navigation. Nevertheless, as the old saying goes, to err is human. Most of the accidents are, in fact, caused by human error, be it the management's fault or the crew's fault. Human error is mentioned as a factor in most of the maritime tragedy. Take overtime work as an example, when seafarers are required to work long hours without adequate rests, no matter how skillful the seafarers are, they are prone to make mistakes. Yet, are these mistakes unavoidable? Many of the accidents can be avoided with proper management and training. By establishing a minimum level of safe manning for ship operation, we can materially enhance maritime safety and reduce the occurrence of accidents considerably. In this connection, Hong Kong has been actively participated in the International Maritime Organisation (IMO) and adopted its standards and requirements to promote marine safety. For instance, adopted by IMO in 1978 and entered into force in 1984, the International Convention on Standards of Training, Certification and Watchkeeping for Seafarers (STCW Convention) aims to promote safety of life and property at sea as well as protecting the marine environment by establishing international standards of training, certification and watchkeeping for seafarers. The STCW Convention is implemented in Hong Kong through the Merchant Shipping (Seafarers) Ordinance (Cap. 478) and its subsidiary legislation. To keep training standards in tandem with new technological and operational requirements, IMO adopted a major revision to the STCW Convention in 2010, commonly known as the "Manila Amendments", which updated the training and certification requirements for seafarers to enhance safety during voyage and help them cope with new technologies on board, as well as to avert seafarer misconduct, such as drug and alcohol abuse. In order to enforce the Manila Amendments, the Government has completed a legislative amendment exercise last year which involved 22 regulatory instruments in the existing laws. To ensure marine safety, IMO has been implementing frequent amendments in their conventions, and the HKSAR Government has been taking forward various amendment exercises in order to reflect the latest requirements in the IMO in our legal framework. Ladies and gentlemen, safe manning of vessels is a broad topic of paramount importance. I am glad that we have many captains and professionals attending the conference today to share with us their views about the enhancement of maritime safety and regulations on safe manning. I look forward to valuable ideas and discussion from all of you. May I wish you all a very fruitful and insightful conference. Thank you.